Despite sub-freezing temperatures in PyeongChang, South Korea on Friday, the Tongan olympian and flag bearer famous for appearing shirtless at the start of the Rio Games showed up to the 2018 Winter Olympics Opening Ceremony shirtless and glistening with oil. That's right, the shirtless Tonga guy struck again. 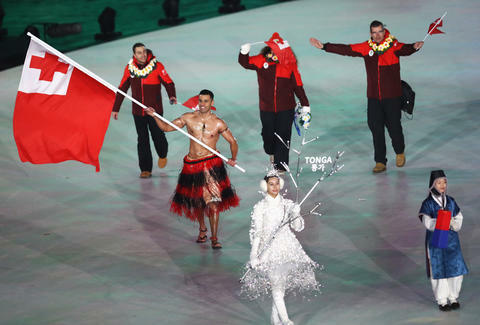 While everyone else was bundled up head to toe in the 28-degree weather, Tonga’s Pita Taufatofua walked out waving the small Pacific island nation's flag in nothing but a thick coating of coconut oil, traditional attire on the lower half of his body, and sandals. Risk of hypothermia be damned, Taufatofua's signature stunt was an all but obligatory repeat of his sensational entrance at the 2016 Summer Olympics in Rio (seen in the clip below), when he grabbed the world's attention with his tanned, oiled abs. Just like last time, the crowd at the stadium erupted in cheers. Although he competed (and was quickly eliminated) in taekwondo at Rio, Taufatofua, 34, quit his job as a social worker and trained for years to return to the Olympics and compete as a cross-country skier at the PyeongChang Games. In the lead-up to the Opening Ceremony, however, Taufatofua suggested he would refrain from showing up shirtless again due to the frigid conditions in PyeongChang. Of course, it should come as no surprise that he ended up baring his shiny chest and abs to the world again. It's practically an Olympics tradition now. The Opening Ceremony aired live on NBC Sports early on Friday morning, but here's how to watch the Opening Ceremony when NBC plays it again primetime on Friday at 8pm ET. Tony Merevick is Senior News Editor at Thrillist and would love to meet shirtless Tonga guy someday. Send news tips to news@thrillist.com and follow him on Twitter @tonymerevick.